New Caption: Boeing B-17F-30-BO Flying Fortress "Invasion 2nd" (42-5070) of the 8th Air Force, 91st Bombardment Group, 401st Bombardment Squadron. In the waist gunner positions are Staff Sergeant Eldon R. Lapp of Fort Wayne, Indiana (May 17, 1920-October 2, 2001) and Staff Sergeant William D. King (January 18, 1923-August 30, 1952) of Imperial, Texas operating the Browning .50 caliber (12.7 mm) machine guns for a Signal Corps photographer. It's likely this photo was made as part of Major William Wyler's efforts to document B-17 operations; when "Invasion 2nd" Was shot down, he focused on "Memphis Belle" which became very famous in "The Memphis Belle: A Story of a Flying Fortress" a 1943 documentary. Note the still prop in the right window; "Invasion 2nd" was on the ground in Bassingbourn, England at the time of the photo. Master Sergeant Jack Gaffney, a member of the crew, painted the nose art on "Invasion 2nd" and several other aircraft. 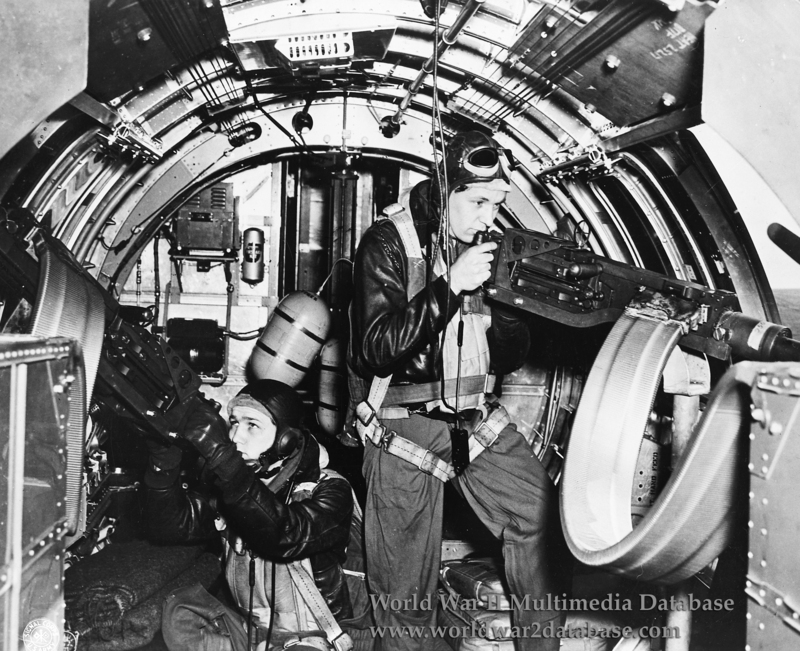 The waist gunners in B-17Fs could collide with each other during combat, disrupting their oxygen supply. This was corrected with staggered waist gun positions on the B-17G. On April 17, 1943, "Invasion 2nd" was shot down near Oldenburg, Germany, on a bombing run on the Focke-Wulf factory in Bremen. "Invasion 2nd" formed the lead plane of the first element of six aircraft making up the lowest squadron. Taking flak hits and attacks by German fighters over the target, the number two engine was completely shot away. The left wing caught on fire and spread to the fuselage. Captain Oscar D. O'Neill called for the crew to bail out but Lapp and King were prevented from leaving by a stuck escape hatch. The ball turret gunner, Technical Sergeant Benedict B. Borostowski, came up into the fuselage from the ball turret and went to the partly open waist door. He found Lapp and King unable to force the door and used his foot to push both of them through. All of the crew members were able to leave the aircraft and survived the jump. Lapp and King were taken to Stalag Luft XVII-B. King was liberated on May 17, 1945; Lapp was liberated on May 19. The other crew members were back in Allied hands by July 3. "Invasion 2nd"'s wreckage was reprocessed by the Germans into raw steel. The 401st Bomb Squadron lost six of nine planes over Bremen on April 17, 1943. King was killed on August 30, 1952 in a Boeing B-29A Superfortress of the 344th Bomb Squadron, 98th Bomb Wing, that crashed four mile north of Taegu, South Korea. All twelve crew members were killed.